Blanche Norward is a certified nursing assistant, member political organizer and a great grandmother. When she started working at a nursing home in Miami in 1975, a gallon of gas cost 44 cents, the average cost of a home was around $39,000 and portable cassette players and recorders were all the rage. Big changes also occurred at her job over the past 43 years. Her starting pay was just $3 per hour, but she united with her co-workers to form a union and secure better wages, and now she makes $17 per hour. Working conditions have also improved. But she fears that many hard-fought wins over the years to ensure workers have a voice on the job may be in jeopardy because of litigation and legislation that seeks to weaken unions. Many of her experienced colleagues in hospitals and nursing homes still don’t make $15 per hour despite decades of service. In the past, Norwood had to work ten straight days and even help out in the kitchen. She and her colleagues were able to right these wrongs by joining together in a union. This election is critically important to Norwood and so many other hardworking Floridians who want to protect their freedoms. From union rights to better wages, and quality, affordable health care, these and other essential freedoms hang in the balance if we don’t support candidates who support working families. That’s why Norwood is reaching out to voters and urging them to make their voices heard at the polls. This isn’t the first time Norwood has been involved in politics. She has worked on several local, state and national campaigns. Norwood has also taken on leadership roles with 1199SEIU. She has served as a delegate and an organizer. 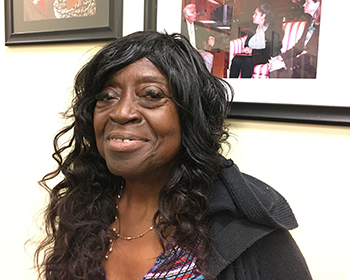 Her organizing work at hospitals and nursing homes has helped many underpaid and overworked caregivers gain a voice on the job and better wages. You can join Norwood and your other union brothers and sisters who are helping to get out the vote. Go to 1199seiu.org/floridaelections to sign up to volunteer.